Why compost? How to make compost at home? Making your own compost protects the environment, because kitchen waste and food-scraps in a landfill decompose without oxygen, producing methane which is a greenhouse gas that is harmful to the environment. Organic Compost can be used as natural fertilizer for your lawn and plants. It is a great natural alternative to chemical fertilizers, and it saves you money. Making your own compost also reduces waste (such as grass clippings and leaves) that you have to put at the curb for garbage collection. Collect your food scraps with kitchen compost bins and save them for the compost pile. Composting is a biological process which happens naturally with the help of bacteria, insects and microorganisms. Your yard waste and food waste break down and become nutrient-rich, earthy smelling soil. 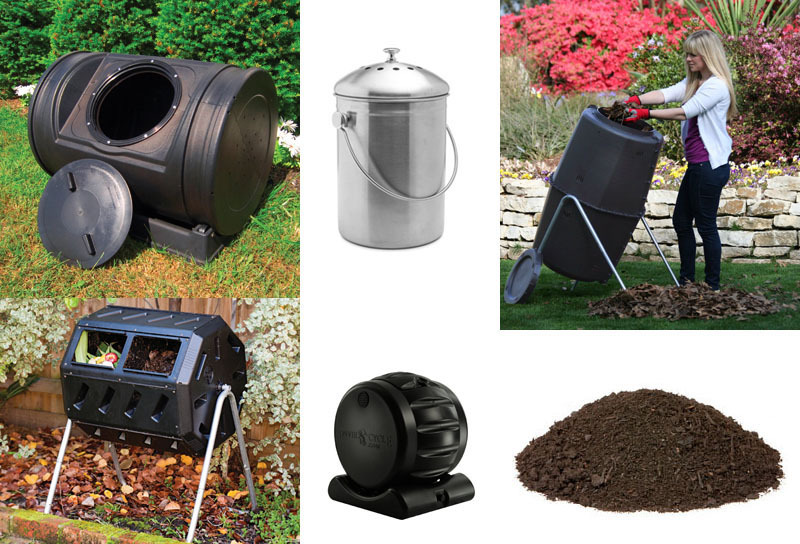 You can make your own compost bins, or buy ready-made compost bins or compost tumblers. Home composting is really easy. You don’t have to be an expert to do it. This page will give you a few tips on how to make compost at home. Four elements are needed to create ideal conditions for making quality organic compost. Nitrogen helps build cell structure. It comes from GREEN materials such as grass clipping, flowers and plant trimmings. Carbon provides energy source in the compost. It comes from BROWN materials such as dry leaves, wood chips, straw and sawdust. Water is a critical element because microorganisms need moisture to live. Add a little water to your compost pile if it gets too dry. You should keep it damp, but not soggy. Oxygen supports microorganisms and insects in the compost pile.